The opportunity to become a student again is such a wonderful gift in life. 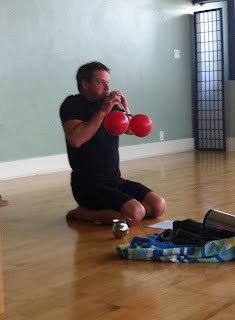 In the first few years following my 200 hour yoga certification, I jumped right into the world of teaching yoga. I taught and talked about yoga A LOT. I taught in a studio, at the beach, on the ocean, to kids, to people stuck in cubicles all day, to groups of girlfriends celebrating their bride-to-be and to just the average studio-go-er looking for a release after a long day. Look, there's me back in 2010! Teaching my lil heart out. For many years, the focus was my students and helping to deepen their yogic experience. 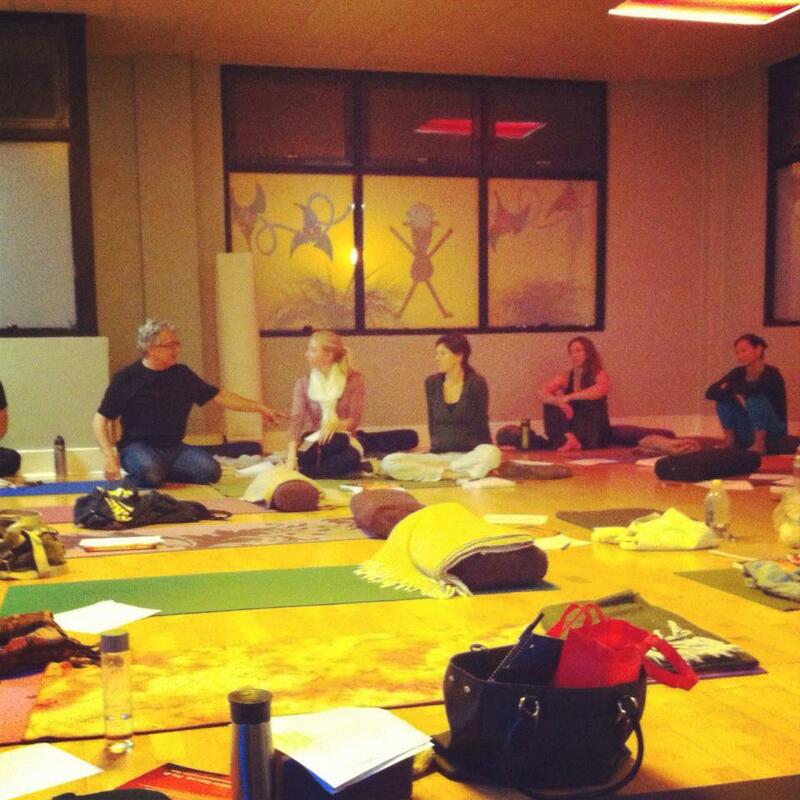 My studentship of yoga took a back seat to my desire to share the yoga love far and wide. Thankfully, the opportunity to pause and re-calibrate my intention on being, first and foremost, a student of yoga arose in the late summer of 2012. A 300 hour-long Professional Teacher Training by YogaWorks and hosted at one of my most beloved local studios, Prana Yoga Center in La Jolla came into my life and I had a choice to make. Continue on the path of enthusiastically sharing yoga in all shapes and sizes without a clear direction as to where I wanted my long-term career to go.... OR ....commit to an almost 7 month long program designed to shape the future of the yoga industry with professional, articulate teachers who instruct safe, intelligent classes and have a clear direction of their long-term career path molded by a concerned and attentive mentor. My answer became quite clear. Despite having to "give up" a few classes and my weekends for the next 7 months, I knew that this was the right next step for me. I love this photo. 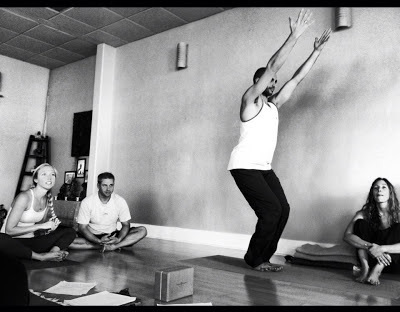 The wide-eyed expression on my face as the talented Rachel Krentzman instructs the anatomical accuracy of Utkatasana perfectly depicts my feeling towards the entire training. 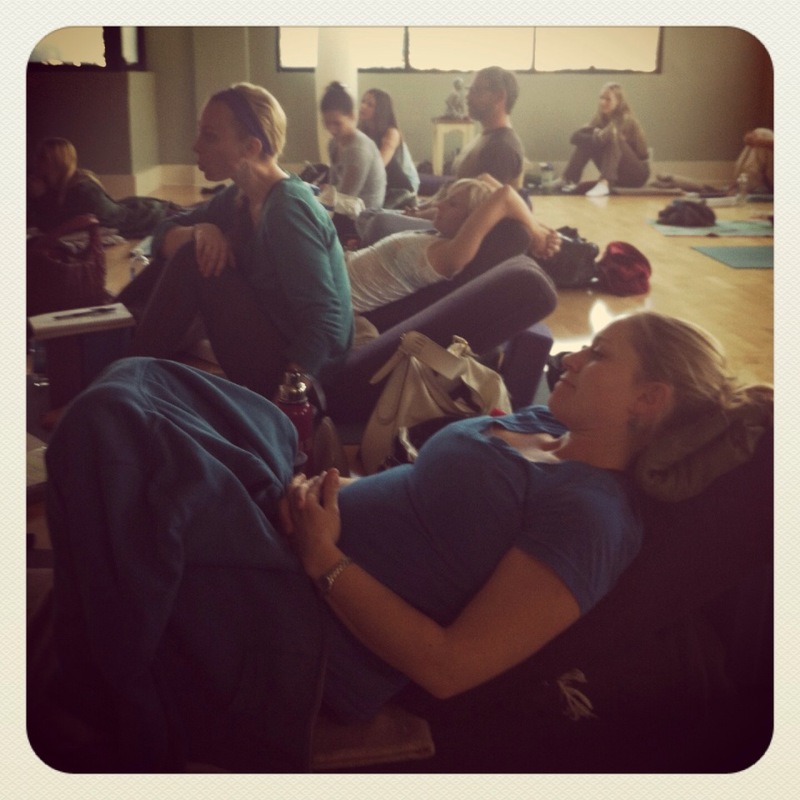 Captivated, mesmerized, enthralled - 300 hours of pure yoga bliss. 1) Meditation is not meant to be boring! We spent three wonderful days with Lorin Roche, an esteemed meditation teacher with over 40 years of study and teaching behind him. He single-handedly reworked the definition I had in my head about what the word, OM means. He explained that OM is truly a celebration of Life. Instead of drawing from outside sources of inspiration, learn to sit still, breathe a little slower and start the process of getting to know yourself from the inside out. When we travel within, there is so much beauty and joy to be discovered. Mediation is not meant to be this solemn experience. It can be a celebration of life from the inside out! *Side note: Lorin also translated the ancient text, Vijnana Bhairava Tantra into what he so eloquently named the Radiance Sutras, which is now my favorite ancient text. 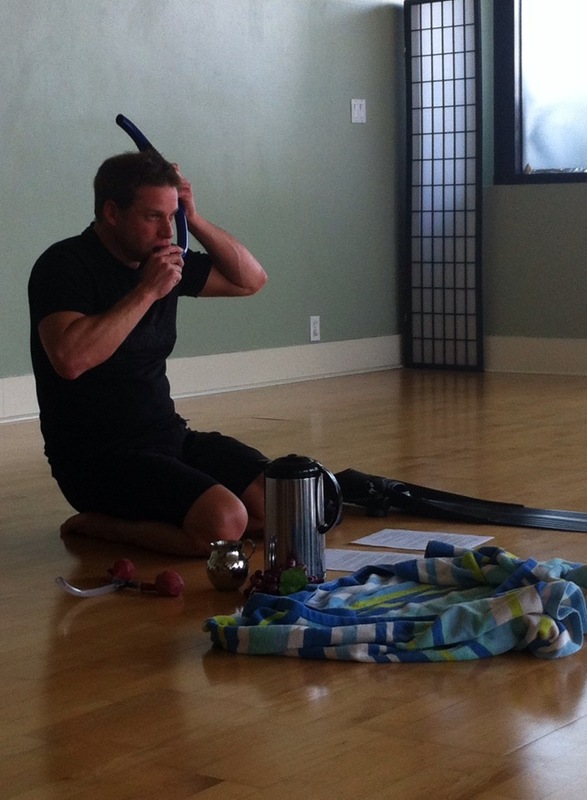 A must read for yoga teachers! found in meditation. Once again, I'm mesmerized. We all are. 2) Stop Stressing Out! Master Iyengar yoga teacher Lisa Walford spoke to us at length about the mind-body connection and what a profound impact it has on one's overall well being. The most profound point she made, to me, was that our bodies do not know the difference between real versus perceived stress. So, if you think the world is caving in on you, your body will respond accordingly. To me, this means I need to stop sweating the small stuff. It's not worth it in the long run. 3) Your voice is beautiful and necessary - Express Yourself! This lesson came out of a long and very memorable weekend with the radiant Suzanne Sterling. According to her bio, Suzanne is "an ecstatic vocalist, innovative composer, teacher and invoker of the sacred." And invoke the sacred she most certainly did! Over the course of many hours of being serenaded by her enchanting voice and her majestic harmonium, she slowly but surely coaxed all 20 of us into chanting at the top of our lungs. It was a powerful experience, especially for those like myself who don't sing. Suzanne made an important point that will stick with me forever: Most cultures encourage singing and dancing, which is our natural state. Our culture tends to discourage this by judging and belittling those that do. (Exhibit A: She asked us to raise our hands if we had ever been told that we had a bad voice. Most everyone did.) Flash forward to today, 8 months since this experience: I have confidently led my students in chanting in almost every class I've taught since then. 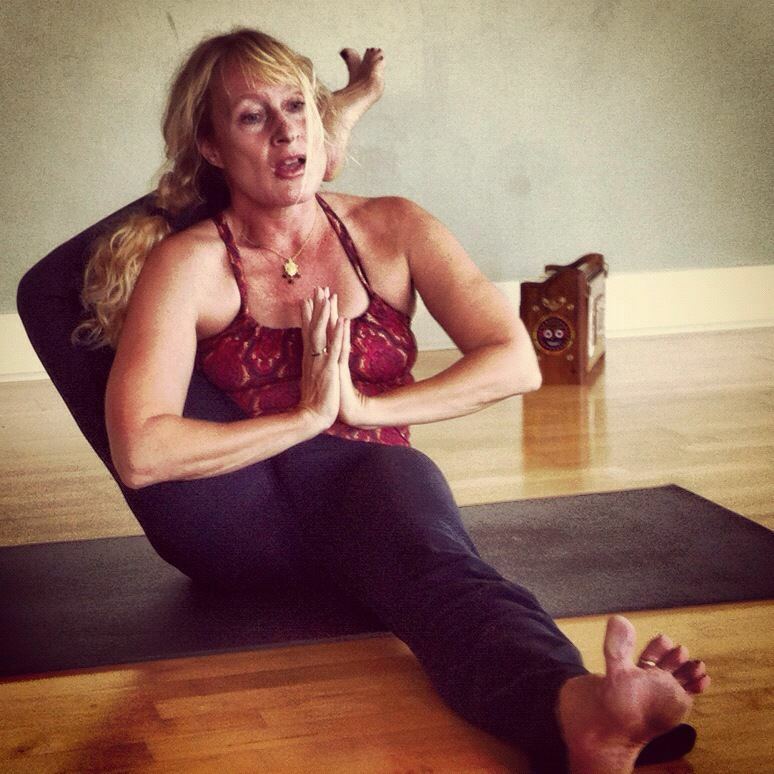 A big Namaste to you, Ms. Sterling! 4) How to be a Business Savvy Yogi - The ability to streamline and specialize will determine your level of success as a yoga teacher. Put simply, there are a TON of yoga teachers out there, with that number probably tripling in the next few years. Everyone needs something to make themselves stand out from the pack. This is not a new concept. Pattabhi Jois did it when he branched out from his guru, Krishnamacharya to create the powerful style known as Ashtanga Yoga. BKS Iyengar did the same when he got into a terrible accident realized that a new style of yoga was needed to heal his body and that others would benefit from it as well. The modern adaptation of this is that maybe in your first few years of teaching you dabble in lots of different things. But then, eventually, you learn to streamline and focus on one or two areas and become really knowledgeable in them. The ability to specialize is not only necessary in today's saturated yoga market, but will also provide you with a true focus and dedication to your specialty. It's a win/win for every body! 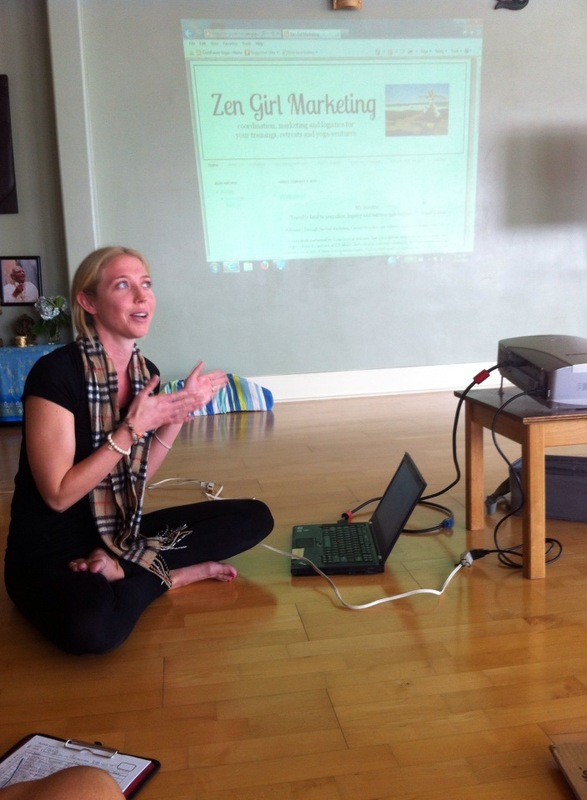 One of my favorite parts of the training is creating a Final Project to present at the end, which represents where you want your yoga career to go. 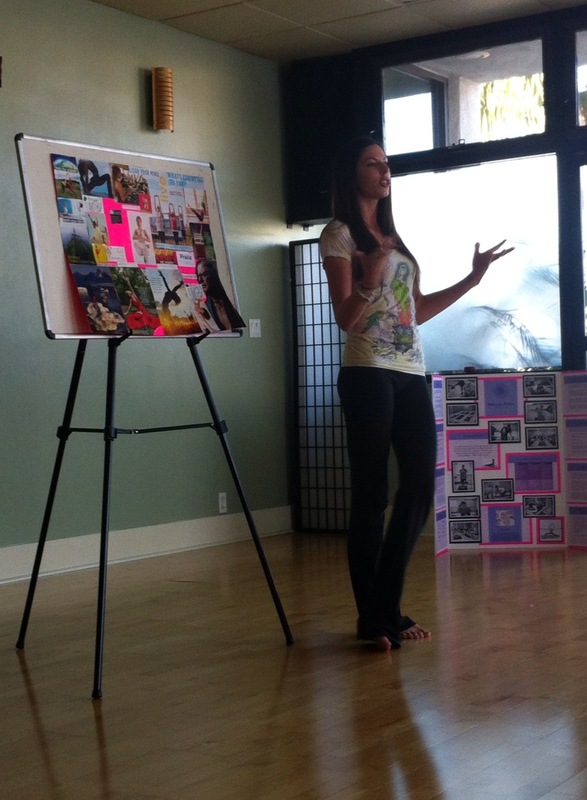 Here I am presenting my concept for a yoga event planning company. Utilizing my background in marketing and logistics, I will provide travel and coordinating services for retreats, teacher trainings and more! 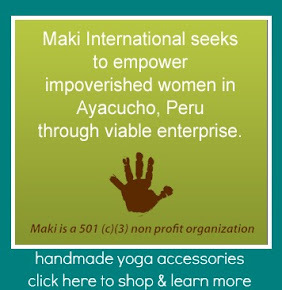 Here are two of my dear yogini friends, Shawnee and Jessica presenting their Final Projects. Shawnee works in schools with special needs children and is developing a full curriculum for working with autistic children through yoga. So inspiring! 5) The Importance of Mentorship - In our modern Western world, the concept of mentorship does not exist in a very meaningful way. Possibly my favorite aspect of the YogaWorks 300hour training is that you are paired with a local master teacher who mentors you through the process and you are expected to complete a formal Apprenticeship with them. The guidance that I was provided by my mentor, Stacy McCarthy will stick with my for the rest of my life. Not only was she able to help me streamline my many projects into one tangible career path, but she was also a great personal role model for me as well. 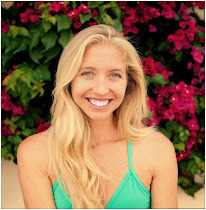 Stacy represents a hard-working, ambitious woman who is committed to spreading the importance of yoga and healthy living, while maintaining a beautiful family life with her husband and two kids. Our mentor group. We love you, NamaStacy! support and uplift each other, the easier life will be. 6) We gotta take care of the Mamas! 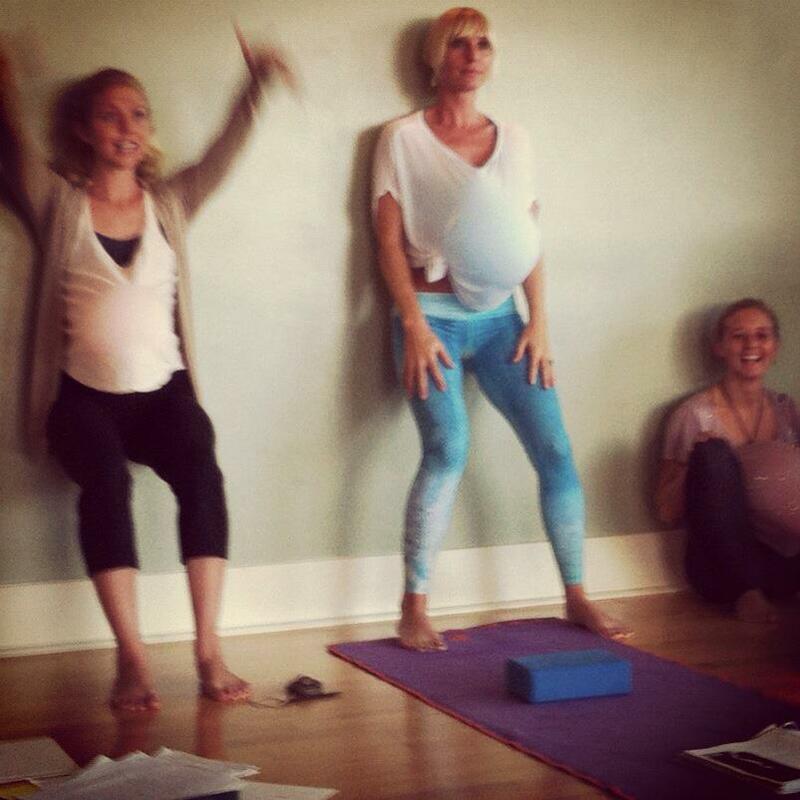 The training included an immersion in teaching Prenatal Yoga and I'm so grateful I was able to experience that. Vicki Abrams is a pregnancy and childbirth expert who co-authored a book called "Magical Beginnings, Enchanted Lives" with Deepak Chopra. She impressed upon us the importance of working with pregnant women in a delicate yet empowering way, as the emotional state of the baby is reflected by the emotional state of the mother. love, compassion and presence throughout our time together. Namaste! Lesson learned: Never take anything too seriously. Even yoga! Right: Erika adjusting Abby. "Your leg WILL get behind your head! It will be firm AND happy." 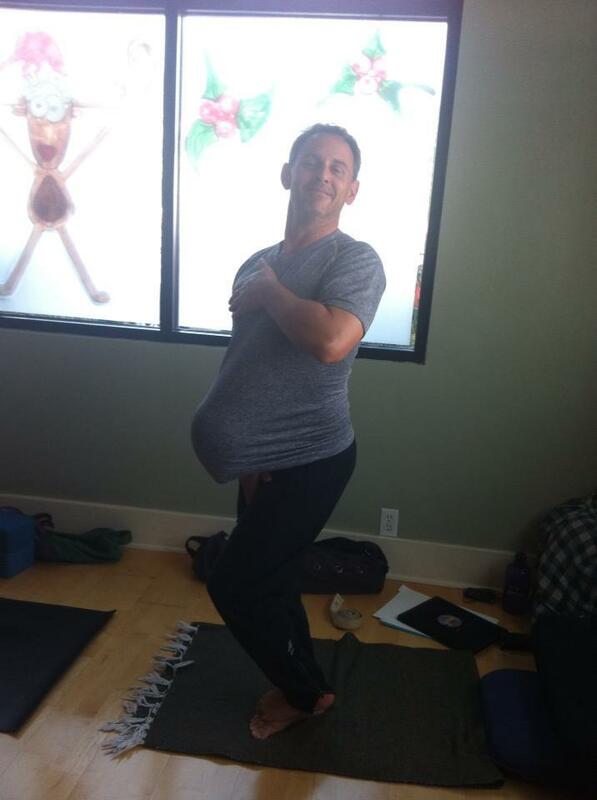 Left: Paul embracing his inner preggo yoga mama. Loving on our mentor, NamaStacy! Great takeaways. It reminds me of when I did this training. So many memories (beautiful memories) came flooding back. Xo. Thanks for the nice post. Yoga has its own benefits. Through yoga people can be healthy. Yoga avoids many problems. 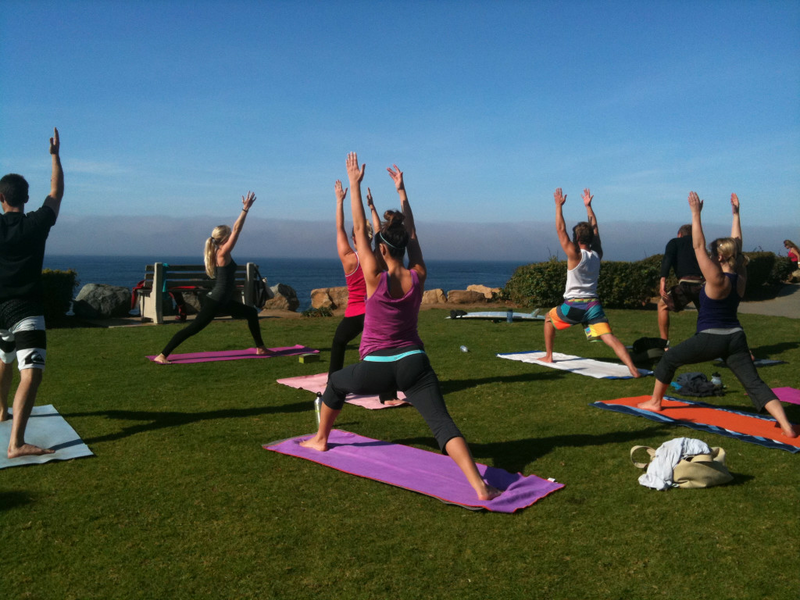 here is a yoga training program which has most experienced trainers.